Mom, the Intern: Sticky notes. When I was a freshman in college, right before I got married, I lived on campus with this cute gal named Karissa. We had some fun times living in Heritage Halls. But I think for Karissa, the most memorable thing about being my roommate was my sleep-talking. Yes, I talk in my sleep. Usually, it happens when I'm really stressed out or anxious. It's not fun for me at all because I wake up the next day feeling like I've been hit by a train. But my roommates sure get a kick out of it. Lucky Dill, he gets to hear my incoherent drivel for the rest of his life! Well, Karissa got this idea to write my most colorful sleep-talk phrases on Post-It notes and stick them to my mirror so I'd be able to read what I'd uttered the night before. Oh boy, there were some good ones. Like, when I was angry at a guy who'd dissed Karissa. I sat straight up in my bed and said, "I'll kill him. I'll KILL HIM!" And then, there was that other time when I tried to give Karissa an economics lesson. 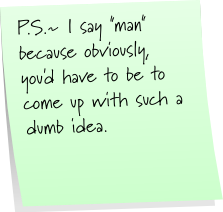 Man, I wish I still had those sticky notes. 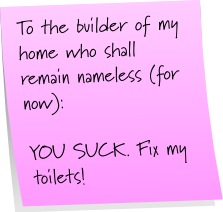 Anyway, I follow this hilarious blog where the author does these cute posts with Post-It notes, inspired by this other fabulous blogger. Check 'em both out! If you think I'm funny, you'll probably die of suffocation when you read these ladies' blogs. You'll be laughing so hard, you won't be able to breathe, and then you might die. 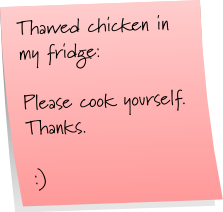 Anyway, here's my Post-It Note Tuesday post. Now, go HERE and make your own! Don't forget to give some linky love to Supah and Glamazon. I think the funniest/scariest part of the "I'll kill him" quote was that you followed up with a pretty quiet but firm, "I can kill anybody!" Oh! I'd forgotten about that part! My sister talks in her sleep too, that would be funny if you still had the notes. 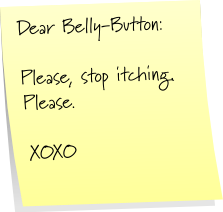 My belly is getting to the itchy stage now too, soo annoying!